ENDE, Centro Atףmico Constituyentes, Av. General Paz 1499, 1650 San Martin, Buenos Aires, ARGENTINA. Universidad Nacional de General San Martin, Buenos Aires, ARGENTINA. Universidad Tecnologica Nacional, Regional Buenos Aires, ARGENTINA. In Buenos Aires, Argentina, on 4th. 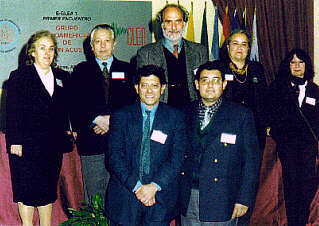 April, 1997, a group of people working in Acoustic Emission (AE), signed an Agreement to create the founding nucleus of the Latin American Acoustic Emission Group (GLEA). The aim was to promote activities such as developing, research, holding of meetings in subjects related to AE and to promote the incorporation of specialists in related topics into this field. GLEA is an organization of no commercial interest, being its objectives only scientific and technological. Within this spirit, we wish to make this Agreement more known among the Scientific and Technological community. The founding members are: Dr. Josי E. Ruzzante, Dr. Marםa Isabel Lףpez Pumarega, Marםa Armeite and Eng. Tulio Palacios, at National Atomic Energy Commission, ARGENTINA, Eng. Pedro Feres Filho, Physical Acoustic Corporation, BRASIL; Dr. Rosa Piotrkowski at San Martםn National University, ARGENTINA, Eng. Miguel ֱngel Sabio Montero at San Juan National University, ARGENTINA; Dr. Carlos E. D’Attellis at Buenos Aires National University, ARGENTINA. A picture of the founding group published by Professor Kanji Ono at the Journal of Acoustic Emission (Vol. 17, No. 1-2, January-June 1999) is shown in Fig. 1. 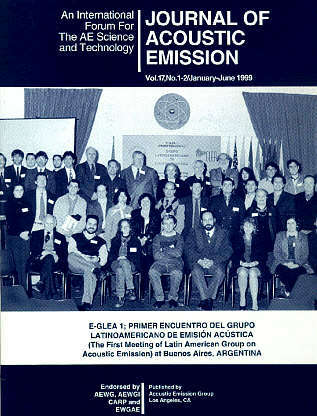 The First Meeting of the Latin American Group of Acoustic Emission, E-GLEA 1, was held during September 6-10, 1999, at Buenos Aires, Argentina. The objective of this Meeting was to contribute to improve and stimulate the understanding of all disciplines related to AE. E-GLEA 1 was addressed to young graduate students, professionals and technicians from research/teaching institutions and industries that use AE or any other complementary technique. Recognized specialists gave a series of lectures. Specially invited works were presented as posters to promote discussion and scientific interaction between authors and participants. An exhibition of AE equipment was held in conjunction with the academic activities. During this Meeting, GLEA members considered the possibility of extending the Group as an Ibero American one, and fixed a next Meeting in 2001, at Buenos Aires. AE in advanced material, electronics, magneto-acoustic emission. AE in structures, pressure vessels, pipes, reactors, aeronautics, mortar, and equipment. AE sparks detection in transformers. Signal processing and mathematical models. Monitoring of manufacture processes, welding, machining. AE in seismology and geology (earthquakes, mines, etc). AE Standards, norms, qualification of AE operators;. History and precedents of AE. E-GLEA 1 was organized by GLEA and Comisiףn Nacional de Energםa Atףmica and sponsored by: Argentine National Agency of Scientific and Technical Promotion, Universidad Nacional de General San Martםn; Physical Acoustic Argentina S.A.; Qualicontrol S.A.; Morken S.A. and Instituto de Materiales y Suelos (Universidad Nacional de San Juan). E-GLEA 1 Proceedings were published and distributed during October, 2000. The event was reported by Professor Kanji Ono, Editor of the Journal of Acoustic Emission, who was specially invited to E-GLEA 1, and he published a picture of all participants on the cover of the Journal. This is shown in Fig. 2. 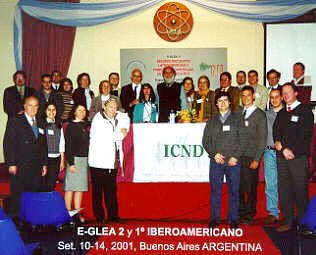 As it was set during E-GLEA 1, on 2001 the First Ibero American Meeting of Acoustic Emission and Second Meeting of the Latin American Group of Acoustic Emission, E-GLEA 2, took place during September 10-14, in Buenos Aires, Argentina. This Second Meeting began with an Acoustic Emission School, specially addressed to those engineers, scientists, technicians and people willing to discover the potential of these technique in industrial activities. In the second part of the Meeting, different conferences related with both academic and applicable aspects of topics took place. Reported applications were about oil chemical plants, distillation plants, concrete structures, etc. The Second Meeting was sponsored by: Argentine National Agency of Scientific and Technical Promotion, Embassy of Italy in Buenos Aires, Engineering Faculty of Buenos Aires University, Delta and Buenos Aires Faculties of the National Technological University, Jose A. Balseiro Foundation, MORKEN S. A, Constituyentes Technological Pole, TISEC S. A., QUALICONTROL S.A., and General San Martin National University. The E-GLEA 2 Meeting Opening Ceremony was with the presence of Dr. Giuseppe Nardoni, President of the "International Committee for Non- Destructive Testing" and of the "Non-Destructive Tests Italian Society", and Dr. Roberto Semenzato, Scientific Attachי of the Embassy of Italy in Buenos Aires. Specialists from Argentina and from the world participated in the Meeting. Among the local professionals we can mention Dr Josי Ruzzante, Dr. Horacio Lescano, Dr. Marםa Isabel Lףpez Pumarega, Dr. Rosa Piotrkowski, Eng. Mag. Miguel Angel Sabio Montero, Eng. J. J. Piסeyro, Dr. Marםa Aurora Rebollo, Dr. Eduardo Serrano, Eng. Claudio Verrastro, Among the experts from abroad, that specially came to the event we can mention Dr. Giuseppe Nardoni (Italy), Eng. Pedro Feres Filho (Brazil), Dr. Chris Scruby (Great Britain), Dr. Edoardo Milotti (Italy), Eng. Gabriele Paparo (Italy), Eng. Sergio Damasceno Soares (Brazil), Dr. Marםa Teresa Garcםa Hernֱndez (Spain), Dr. Antolino Gallego Molina (Spain). It was decided to incorporate in the GLEA WEB page sections corresponding to the areas: Acoustic Emission (AE) Basic Theory, Technological Applications of AE, Research and Development in AE, Instrumentation in AE, Procedures for AE Tests. With this purpose we are asking the collaboration of associates. The instructions for paper submission are to be determined. It was also decided to perform a Discussion Forum with different areas in the WEB page. The experience of the NOTIMAT Internet site was emphasized by different international correspondents. Sergio Damasceno Soares proposed Rםo de Janeiro, Brazil, as the next location for the Meeting that could be performed joint with the "Third Pan-American Congress on Non Destructive Testing", sponsored by ABENDE and ASNT. This idea was accepted. Antolino Gallego Molina´s proposal was accepted in the sense of selecting the location of this event in the University of Granada, Spain. Possibly it will be sponsored by the University School of Technical Architecture and the AE Group. It was commented that standards for Non-Destructive Tests in Brazil are responsibility of ABENDE. In ABENDE they have begun to identify the staff with level III in AE, in order to subsequently qualify the staff of level I. The IRAM Institute proposed to exchange documentation with Brazil in order to achieve the first Level III in Argentina, which would be given according to antecedents to a very reduced group of specialists. The National Atomic Energy Commission could be the qualifying entity. Then the program of courses, the exams questions, the test procedures, the specimens to be tested and the necessary equipment have to be determined. Fig 3: Attendants to the E-GLEA 2 Meeting. In the center Dr. G. Nardoni and Dr. J.E. Ruzzante. The success of the E-GLEA 2 was remarked. The participation of specialists from Great Britain, Brazil, Spain, Uruguay, Italy and Argentina, the high level of the talks and the warmness and cordiality of the whole meeting was emphasized. Members of various National Universities participated: Buenos Aires, Technological, San Juan, San Martin, and the Universities of Granada and Jaen from Spain. During April of 2002, the Proceedings of the Meeting were published and distributed. Dr. Giuseppe Nardoni published some E-GLEA 2 photos in the "Journal of the ICNDT ", No. 1, January, 2002, one of which is in Fig. 3. An announcement of E-GLEA 3 Meeting was just included in the first brochure of the "3rd Pan American Conference for Non Destructive Testing, PANNDT" to be held during June 2-6, 2003, in Rio de Janeiro, Brazil. Up to now there are more than 200 members from all Latin America and Spain. GLEA has correspondents from: Argentina, Bolivia, Brazil, Spain, Mexico, Uruguay, and the United States of America. The GLEA foundation and achievements described so far, constitute an example of how to overcome with faith and hard working the economical difficulties. We are proud of it, and in the name of all associates, we are inviting the scientific and technological community interested in AE, to more affiliations and fruitful exchanges.